I have four new comers in my little kitchen at the moment and I love them all equally. A flat bottomed wok- who knew cooking could be so quick and easy with this little fella. A super sharp lame (French blade for cutting my sourdough)- slash, slash, slash! and….my new Banneton. Otherwise known as Brotform or Brotformen…Other, otherwise known as a little basket to prove your bread in. This I have to say is my favourite. Lovingly stored away at night, ready to work its banneton magic on my bread the next day. If I tucked it up and gave it a good night kiss, I wouldn’t be surprised. … Mr Chocolate might be though. Mix ingredients together, then leaving for an hour or so. Into fridge for a lovely long and slow ferment for 12 hours. Out of fridge and fold the dough. Leaving to prove for approximately two hours. Fold again and popped into my lovely, lovely new banneton. Prove until, I couldn’t stand the excitement any longer and had to pop the dough in the oven to see how my new basket had shaped up. Baked at 250C with steam on top shelf for approximately 20mins and then down to the bottom shelf for a further 10 minutes. This loaf I have made a few times now and I’m really happy with the results. It keeps beautifully and still toasting well a week later. Topped with the Lime and Cumquat Marmalade and my morning begins. * This post submitted to Yeastspotting. 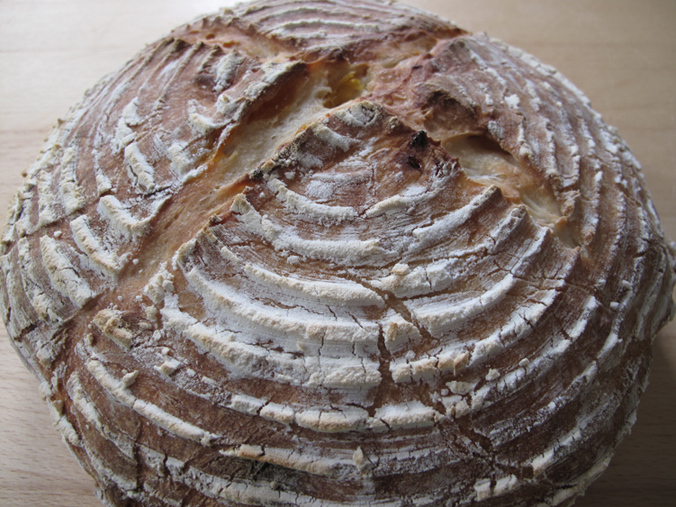 This entry was posted in Baking Bread and tagged apricot and sunflower sourdough, bread, food, home made bread, natural yeast, recipes by cityhippyfarmgirl. Bookmark the permalink. Again I am drooling. Is there a cookbook in your future? ohh, how lovely would that be. You sound quite smitten 🙂 Nice loaf !!! I love sunflower seeds in bread, sometimes I toast them before adding them to the dough and put untoasted ones on the top. One can never have too many in a dough. I agree, never too many seeds to be had. I’m hungry just looking at that. Actually me too… I think I need to make some more. Good to hear I’m not the only one Anna. Sometimes they like to hear words of encouragement as well. Magnificent! What size banneton did you buy? Just look at those lovely ridges! Celia I think it was the 750gm. Not too big and not too small. It really is lovely! And toasted, maybe with a slice of cheese- I could fall in love with this bread. I love toast- and apricots and sunflower seeds embedded in the toast- paradise on a plate. Toast, it just works for many a meal doesn’t it. Ahh. 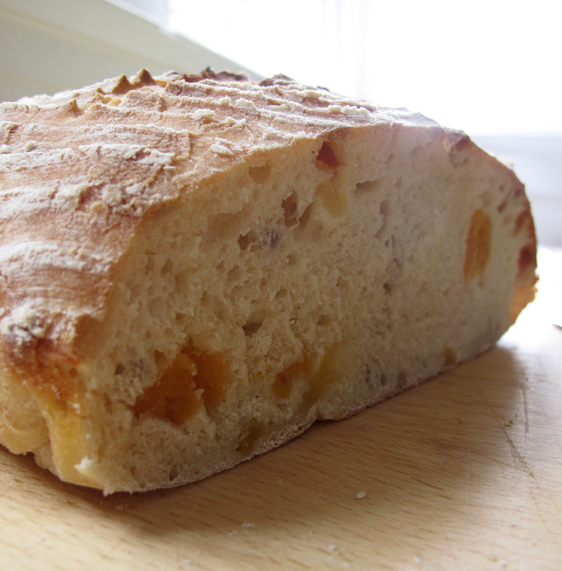 That looks truly crusty and dense – not always a good thing in other settings – but spot on for bread! Not long now, before sourdoughs are coming out of your oven Wendy! Looks superb, you’re banneton has done a great job. You’re really getting into your sourdough making now and this sounds lovely. Everyone’s putting me to shame and I keep thinking I should be a bit more adventurous with my plain old rye sourdough. I do put pumpkin seeds in as a matter of course but other than occasional caraways seeds haven’t tried anything else. I get loads of ideas and say, next time I’ll try that, but somehow don’t seem to manage it – hey ho! I still love making the sourdough. It’s so forgiving. I think if it was a delicate and tricky thing to do I certainly wouldn’t love it so much. I have a date and macadamia one ready to get ‘groovy’ in the banetton this morning. It’s funny how a cane basket can make me smile contentedly.